Dana Point Harbor invites locals and visiting destination seekers to explore the abundance of ocean activities, dockside dining options, and shopping experiences the Harbor has to offer during spring break. 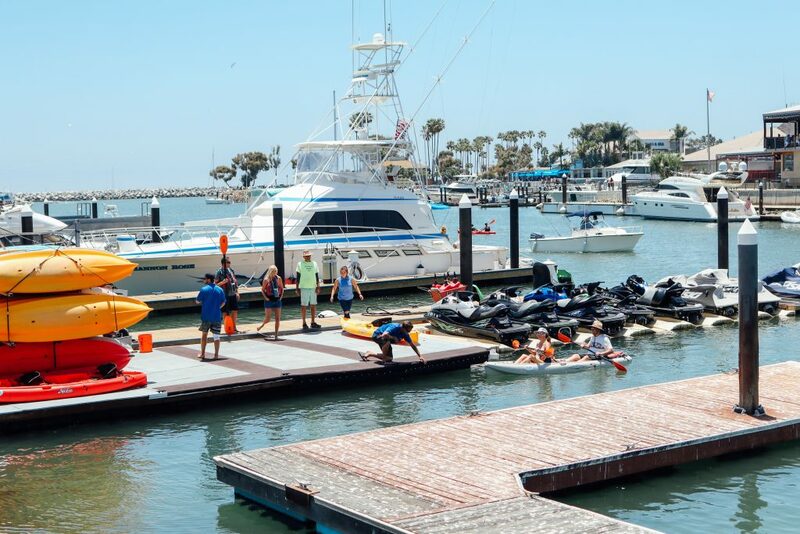 Whether you are looking for adventure, fun, or relaxation this season, Dana Point Harbor offers something unique for everyone. Popular spring activities in the Harbor include strolling along the water’s edge, sailing, kayaking, paddleboarding, ocean fishing, and whale watching trips. Activities abound both in and out of the water, so for those looking to enjoy the calm waters and wondrous sea creatures without getting wet, hop on one of the many whale watching excursions offered at the Harbor including Captain Dave’s Dolphin & Whale Watching Safari, Dana Wharf Sportfishing and Whale Watching, and Ocean Adventures. Add some relaxation to your spring break getaway by joining a class at I Heart Yoga, voted the #1 yoga studio in Dana Point. I Heart Yoga also hosts classes daily at Lantern Bay Park, with a picturesque view overlooking the Harbor. As you are strolling through the Harbor you’re sure to find one-of-a-kind boutiques and shops filled with unexpected treasures. You won’t want to miss the sterling silver and gold jewelry handcrafted by artisans of the Navajo, Zuni, Hopi and Santo Domingo from The White Pelican and ocean-inspired jewelry, clothing, and gifts from Woody Hut. Other shopping delights include special cards, art collectibles, designer perfumes, clothing for men, women, and children, artisan chocolates, and specialty coffee and teas from around the world. Spark your taste buds this spring break and enjoy one of the many eateries throughout the Harbor. From seasonal savory eats to indulgent sweets, there’s a pleasure for every palate. Sip hot coffee and read a book on the patio at Coffee Importers. Stop in and sip award-winning wines from Paso Robles at the recently opened Frisby Cellars Tasting Room. The 2017 Chardonnay has notes of honey crisp apple and lemon, perfect for spring! Indulge in a leisurely seaside brunch at one of Southern California’s premier restaurant destinations for Pacific Rim fusion cuisine, Wind & Sea. Enjoy sustainable and locally sourced seafood from Waterman’s Harbor, or the mesquite-grilled fresh catches at The Harbor Grill, and experience all of the delicious Harbor eateries with breathtaking water views. Make sure to check out the only in-Harbor hotel, Dana Point Marina Inn, for overnight stays perfect for relaxation and an ideal location to extend your time at the Harbor. Spend spring break at Dana Point Harbor and enjoy all of the adventure, fun, and relaxation available for the entire family. For more information visit DanaPointHarbor.com or connect with us via Facebook, Instagram, or Twitter.